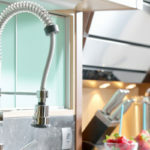 Dysfunctional layout, fragile materials, and even forgetting to add ventilation are just a few common kitchen remodel mistakes. Knowing what others regret about their decisions can help you avoid kitchen remodel disasters. Your kitchen remodel can be a successful endeavor or a list of dreaded decisions you wish to undo. Don’t let the stress of your kitchen remodel get to you. You can avoid making the mistakes of others, but first you must know what they are. Tops Kitchen Cabinet can help improve the results of your kitchen remodel, regardless of your budget. We sell wholesale kitchen countertops, cabinets and more so that you don’t have to break the bank to get the kitchen of your dreams. One of the biggest complaints about kitchens has to do with a lack of countertop space. Even if the kitchen appears large and spacious, if there isn’t enough countertop space you can’t comfortably prep food. Countertops are a popular place to store coffee machines, blenders, toasters, breadboxes and other appliances. In other words, you’re always going to need a little more space than you think. Avoid making this mistake by asking yourself: Will there be enough room to prep and cook, as well as store staple items? What materials do you plan to outfit your kitchen with? Some materials are made to last a long time without the need for much maintenance, while other materials need constant (and costly) TLC. Granite countertops provide a beautiful surface that is durable and requires very little maintenance while lasting many years to come. On the other hand, other materials such as marble, natural wood or high priced stone may require frequent maintenance while easily absorbing stains, nicks and other damages. Don’t pick a material because of the way it looks. Avoid making material mistakes by doing your research and finding materials suited to your lifestyle and preferences. ‘The triangle layout’ has been used for years as a method of designing a productive kitchen. This layout links the sink, stove and refrigerator in a triangle shape, as these are the three most commonly used appliances in your kitchen. Ignoring the importance of layout will result in a dysfunctional kitchen where doors swing out and block other doors. Or, you could end up walking here there and everywhere to get simple tasks accomplished. Avoid this mistake by thinking through every step of your kitchen layout to ensure it works for you. Look at pictures of functional kitchens to get a good idea of what sorts of layouts work best. Ask your friends and neighbors what makes their kitchens more or less convenient and then use these ideas to help design your remodel. A kitchen island can be your best friend, serving as additional storage and countertop space. That doesn’t mean an island fits in every single kitchen, hence why many kitchens are designed sans island. If you add an island in the wrong spot it can actually obstruct your workspace and make it more difficult for you to get stuff done. The best kitchen layouts for islands include single wall and L-shaped kitchens, on the other hand if you are planning a U-shaped kitchen you need enough space to install the island. 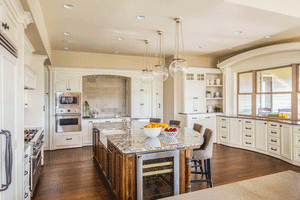 Typically, islands should only be placed in kitchens that measure at least 13-feet wide. We understand the desire to get cracking on your kitchen remodel as soon as possible, but rushing ahead could end up costing you additional money and time. Before you rip down old cabinets or start installing new flooring you need to have your entire remodel plan in place, including materials and contractors. Otherwise, the likelihood of making mistakes and having to rip up new work is not only a possibility but very likely. Your kitchen is home to all kinds of smells, none of which you want lingering around (except for maybe the smell of freshly baked cookies!) If you’ve ever entered a kitchen that stunk of last night’s fish, the problem likely relates to poor ventilation. Ventilation is SO important in the kitchen, not only to keep it smelling fresh but also to protect your health. The kitchen is full of smoke that contains toxins. These toxins impact your health and the cleanliness of your kitchen. Without proper ventilation smoke lingers around, clinging to countertops, walls and other surfaces and creating an icky build up. Gas range stoves provide quality ventilation you need. Another option is to install a full ventilation system that relies on fans to route air in and out through ductwork and out of roof or wall-mounted vents. 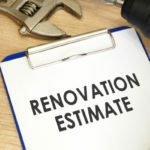 Even if you are going for a DIY kitchen remodel you might want to consider hiring a general contractor to ensure the process goes as smoothly as possible. A kitchen remodel is complex, expensive and time consuming. Unless you have nothing else to do every day, you don’t likely have time for all of the hassles that come with being your own general contractor. Hiring a poor general contractor is just as big of a mistake, if not a bigger one. Always do your research ahead of time to make sure a contractor is prepared to do a job well done. A contractor is only as good as previous projects so ask to see pictures from completed remodels as well as contact information for previous clients. Your kitchen budget should include 15-20% for unexpected costs. The more components of your kitchen you plan to change, the greater these unexpected costs have the potential to grow. If you plan a kitchen remodel and use up every last inch of your budget doing so, what will happen if you run into a costly issue along the way? Instead of crossing that bridge when you reach it, it’s always best to plan ahead for the worst. If nothing unexpected pops up, you can use that money for something on your splurge list. If you are all about creating a kitchen that speaks to the most current trends… just wait. Do you really want a kitchen that is so trendy it goes out of style in a few years? Considering how much of an investment a kitchen remodel is, it’s important to create a look that will remain in style for as long as your kitchen remains a functional and working space. Keep larger elements of your kitchen more traditional, and use smaller knickknacks or affordable appliances to add some trendy touches. If you have plans to sell your home in the future, the last thing you want to do is create a look that future homebuyers will not appreciate or even worse, want to change the moment they move in. That fancy gas range stove is mighty dreamy, but before you indulge you must accept the fact you will never get your investment back. Super high end or specialized improvements do not pay for themselves, although less trendy kitchen remodels do fetch back a large percentage of their overall cost in resale value. The little stuff matters when designing your kitchen. Always say yes to extra drawers or convenient organization options, as these are the things you appreciate most once you are actually using the kitchen. Having an easy to access space to store all of your things is the greatest value of all. Cabinets made to hold spices, roll out drawers that hold appliances and other convenient features make your kitchen the envy of all who use it, not just look at it. Choosing your designated kitchen appliances should come first in the kitchen planning process. 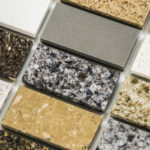 It’s much easier to match the appropriate countertops, cabinets and overall design of your kitchen if you know exactly what appliances you plan to install. Otherwise, you are stuck picking appliances that fit around your cabinets and countertops, thus seriously limiting your options. Even if you’re planning to create a plain white kitchen that appeals to the masses, don’t forget to add a splash of colorful fun. There are plenty of safe spaces you can use to adorn with added style, such as the backsplash behind the stove. You could also add a few glass-faced cabinets with colorful accessories or pretty China tucked inside on display. Door handles are another way to add a touch of style that won’t break the bank or deter future homebuyers. You can save SO much money by buying wholesale cabinets, countertops and other costly kitchen elements. There’s no reason to pay full price when you can score the same materials for less. Your entire kitchen remodel will turn out differently if you go with full price retail materials, simply because your budget is not going to go as far. On the other hand, buying wholesale frees up thousands of dollars in your budget. 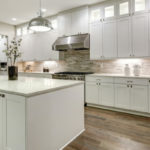 Tops Kitchen Cabinet offers high quality kitchen cabinets, countertops and more at wholesale prices you’re sure to love!